with the word "Founder" thereon and a sky blue ribbon. The Jewel comprises of silver plaque with a prominent yellow Compass and Square superimposed on a shield with the cross of St. Patrick thereon. At the top of the Compass, in sky blue enamel, is the name of the Lodge, “Emerald in the East", together with six green enamel shamrocks, and at the bottom thereof "Lodge No. 830 I.C. ", with three green enamel shamrocks below. Short History of Warrant No. 830. Warrant No. 830 issued to brethren in Irvinestown, County Fermanagh on the 3rd March, 1796. Warrant No. 830 was sent in and exchanged for Warrant No. 288 on the 24th February, 1823. History of Emerald in the East Lodge No. 830. "16 February, 1966 – The Board considered the Memorial from sundry Brethren which was handed to the Grand Treasurer and Grand Secretary at Singapore in February, 1965 requesting Grand Lodge to issue a new Warrant to establish a Lodge at Kuala Lumpur, Malaysia. The Deputy Grand Master outlined the correspondence which had taken place about the application in accordance with the agreed practice since 1959, with the Grand Lodge’s considering application for a Warrant in Masonic territory open to the three Grand Lodges and where one of those Grand Lodges and not previously had a Lodge. The Board recommended Grand Lodge to issue a Warrant to the Memorialists to establish a Lodge at Kuala Lumpur, to be numbered 830." The Recommendation of The Board was followed,as is shown in the Grand Lodge Minutes of 3rd March, 1966 as "Confirmed". Warrant No. 830 reissued to `Emerald in the East Lodge' in KULA LUMPUR, Malaysia on the 3rd March, 1966. "Warrant No. 830 to Kuala Lumpur as “Emerald in the East Lodge”, 3 March, 1966 - Charles B. Wilson, MD., (764); Kingsley H. Dorloff, MD., (3369 EC) and Arthur G. Livingstone, Clerk (500) registered along with 82 others from various lodges and Constitutions, 3 March, 1966." In 1966 Lodge Emerald in the East No. 830 was erected in Kaula Lumpur, again extending the Inspectorate Area. Bro. A.W.S. Smith chose to remain as Assistant Grand Inspector and R.W. Bro. P.J. Hope became the Grand Inspector, concurrently holding the office as the Provincial Prior of the Far East. Bro. Smith was in poor health as a result of having been caught in a landslide during Typhoon Wanda and exposed on the hill side until rescued the following day. Irish Freemasonry in the area was fortunate in finding two expert Craftsmen who were destined to contribute enormously to Lodge Emerald, the first being W. Bro. Charles C. Bowman who travelled frequently between Kuala Lumpur and Singapore and had many friends in Klang Lodge to which he was affiliated. The second was Bro. Arthur Livingstone who turned out to be a veritable masonic "jewel". With the gathering momentum, W. Bro. C.C. Bowman and Bro. Arthur Livingstone held consultations with V.W. Bro. C.B. Wilson, Assistant Grand Inspector and V.W. Bro. D.A.J. Bruford, Lodge St. Patrick's Director of Ceremonies. A Petition under the sponsorship of Lodge St. Patrick was sent to the Grand Lodge of Ireland for a Warrant of Constitution which, the strong objections of the English and Scottish Districts notwithstanding, was granted in 1966. With the Warrant in hand and with support especially from Klang Lodge, a pioneering group of Brethren formed an organising Committee to discuss the realities and mechanics of actually getting the Lodge started. The first meeting of the Committee was finally held on 9th October 1966, at Read Masonic Temple in Jalan Damansara, Kuala Lumpur. Although not present at that Meeting, V.W. Bro. C.B. Wilson was unanimously elected Founder Master with:-W. Bro. Kingsley Oorloff, S.W. ; Bro. Arthur Livingstone, J.W. ; W. Bro. C.C. Bowman, Secretary and V.W. Bro. D.A.J. Bruford, Director of Ceremonies. "That the Read Temple Committee regrets that it cannot consent to the use of the Temple by the proposed Irish Lodge until such time as the proposed Irish Lodge receives recognition by the District Grand Lodge of the Eastern Archipelago and the District Grand Lodge of the Middle East and that the Secretary be instructed to inform the proposed Lodge and the two Districts accordingly." This however did not dampen the spirits of the Brethren concerned. Further meetings of the Committee were held elsewhere and, by the end of the year, arrangements were already in hand for the use of a school hall, which were considered adequate, even though it would have required the use of two Tylers! But, unexpectedly, a letter was received from Read Temple Committee to the effect that, subject to confirmation by the Deputy District Grand Master in Charge, Lodge Emerald in the East may be allowed the use of Read Temple on the same terms and conditions as the other Lodges of the English and Scottish Districts. Within a week, the appropriate consent was received from the Deputy District Grand Master in Charge. With the objections of the English and Scottish Districts now withdrawn, arrangements were made for the Constitution on the earliest available Saturday, which turned out to be 1st April, 1967. Frantic preparations were made and, as is inevitable under such pressure, something had to be forgotten, and it turned out to be the photographer, hence no pictorial record of the Constitution Officers. Although V.W. Bro. C.B. Wilson was already an Installed Master of the Irish Constitution, the ceremony of Installation was performed in full so that Brethren in Kuala Lumpur could, for the first time in many cases, witness an Irish Installation Ceremony, and so appreciate the simple Irish approach to Freemasonry. With the formation of Lodge Emerald in the East, the Inspectorate Area of Hong Kong, China and Malaya was now split into two, the Hong Kong Lodges forming the Inspectorate Area of the Far East and Lodge St. Patrick combining with Lodge Emerald in the East to form the Inspectorate Area of Singapore and Malaysia (later renames South East Asia). R.W. Bro. C.B. Wilson was appointed Grand Inspector and V.W. Bro. D.A.J. Bruford his Assistant. A total of 203 brethren registered up to 17th October, 1984. In most cases the dates when the issue of certificates is shown, together with the occupation of the brother. From 1984 the registration of members of EMERALD IN THE EAST LODGE No. 830 is held, in alphabetical order, in a computerised register by Grand Lodge, Freemasons’ Hall, 17 Molesworth Street, Dublin 2. The Registration of the Worshipful Master, Wardens and Secretary of Lodges are held in separate Registers, the first Volume covering the period 1983 to 1994 inclusive and the second Volume covering from 1995 to date. Details of when Emerald in the East Lodge No. 830 meets. 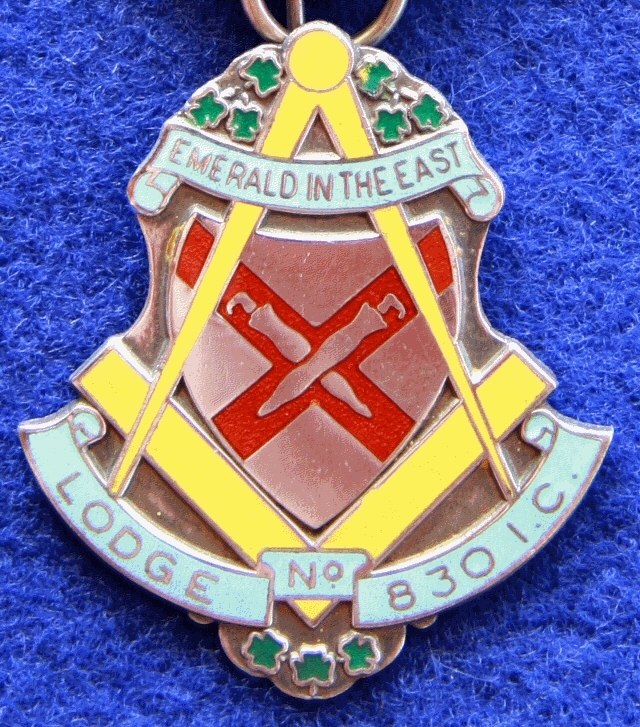 Emerald in the East Lodge No. 830 meets on the 3rd Thurs. at 6.30p.m. at Dewan Freemason, Bukit OUG, Jalan 3/155, 58200 Kuala Lumpur.